Narrative style: A series of happenings that involve the same characters but are not connected by an over-arching narrative. Third person. Synopsis: An epic novel spanning the life of Father Jean Marie Latour as he becomes Vicar Apostolic to New Mexico. 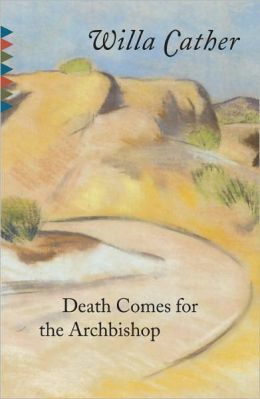 The novel takes us from the beginning of his career through to his becoming Archbishop and eventual death. Time on Shelf: This is one of the oldest unreads on my shelf. I bought it while at university some twenty or so years ago. I had come across Cather’s name in books on feminist writing and so when I saw it second hand I picked it up. However, I then didn’t really fancy the subject matter, hence it languishing on the shelf for quite so long. There is no denying that this is beautifully written. Cather can certainly turn a phrase and for me to have kept on reading this, despite my lack of interest in matters of religion is testament to the strength of her prose. The countryside and the characters are all impeccably described and vivid to the reader. Latour and his assistant and friend, Father Joseph Vaillant, were interesting in their missionary zeal even while I could not share their enthusiasm. Both were based on real men and many of the events were based in reality which only makes it more remarkable. The main reason I didn’t rate this higher was the structure of the novel. I’m not even sure that novel is the right word. There isn’t one storyline here, no overarching plot but a series of scenes, all as important as the other. This led to a lack of tension and I felt there was no reason for reading on. There were no hints of what was to come and little reference to what had been. It was perhaps like a series of short stories which just happened to involve the same group of people. While I am not really interested in religion, I am interested in the period of history described and if nothing else, this book has reminded me of that and ensured I will read more about it in the future.